Tempered Praetorian Gladius What's this? 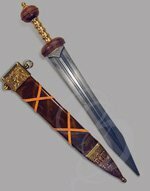 The Praetorian is one of our highest end Roman Gladius. With a beautiful high-carbon steel blade, signature V-tip design, stunning polished-hardwood hilt and a blow-your-socks-off gilded sheath, it doesn't get much better. 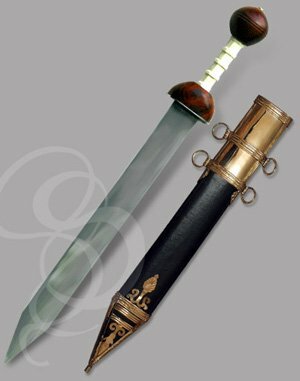 The sword is very similar to our Type III Gladius, but with a killer, praetorian style sheath. The round Pompeii-style pommel and guard on this sword surround a stylish and comfortable ridged grip made of bone. The blade has a rhomboid cross-section, giving it additional strength, and ends with a sharp-angled "V" perfect for thrusting as the Romans tended to do. The sheath on this sword merits a bit of discussion. An ornate, intricate web of brass spreads across the sheath. These designs make this sword equally as attractive sheathed or drawn. 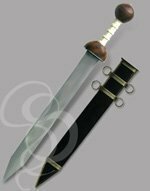 If you like our Type III gladius and want better materials and a gorgeous sheath, then the Titus III is your sword. Includes ornate leather-wrapped wood scabbard with intricate designs in brass. The sword is fantastic and the service was impeccable! I had some special engraving done that didn't quite fit the way the I was hoping on the software and strongblade was very quick to respond and was able to adjust the engraving "exactly" the way I wanted and it looks fantastic... would definitely recommend to purchase here. Shipping and packing was fast done very professionally! The Sword is well made and you can tell it is. Would highly recommend looks great. We bought this as a gift for our son. He loves the sword and it looks really nice. The engraving was exactly as I requested via the custom tool. The order process was easy and simple with no issues. I would recommend this sword. I got these in October of 2916 for my groomsmen. Very cool gifts. I would say that sheath appears to be rather cheap compared to the sword. The blades rust quite rapidly as well, even if they rarely leave the sheath. Other than that the engravings were perfect and it was almost exactly what I had expected. Hi Atlas. We're thrilled that you were happy with the Gladius Praetorian. It's one of our most popular swords, and we're very proud of it. I'm very sorry that you weren't happy with the sheath. The entire sheath is custom made specifically for your particular gladius. The sheath and the decorative brass on the sheath are hand made, not machined. This is more authentic to how they would have been made, historically. Sorry about the rust. Sadly, high-carbon steel blades are prone to rust. It's a problem that has spanned the ages. Fortunately, there are a few things you can do to minimize this. Have a look at the card in the Care and Cleaning kit that came with your sword. If you'd like us to take off the rust for you, we're happy to do it free of charge, if you pick up the shipping costs. You can email us at service@strongblade.com. Wood and leather scabbards are organic, and that tends to speed up the oxidation process when they are in contact with the steel. Also, keeping the blade trapped in the sheath will lock some of the humidity in, speeding up the rusting process even more. Keep the sword out of the sheath whenever you can, and, if you're feeling crazy, hit the blade with a light coat of mineral oil or a metal-protection wax periodically. 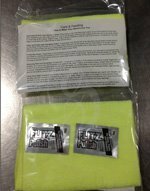 The Flitz polish packets we sent you are a great way to protect the steel. Flitz not only polishes, but it protects against rust as well. And, if you're desperate, a thin coat of WD-40 does the trick as well. Thanks again for your feedback and your order! I was very surprised by the professional appearance and make of the product. I am extremely happy with my purchase and will be shopping on this website again! The rehearsal dinner was last night and the blades were a SMASH!! They were absolutely fantastic and I just wanted to let you know how appreciative I was and wanted to say Thanks Again for the great customer service. You can rest assured if someone asks where they can get blades engraved I will absolutely send them your way. Hope all is well and also to do business with you again in the future.